Treme, described at its simplest, concerns a cross-section of residents of post-Katrina New Orleans. But as exemplified in his previous HBO television dramas The Wire and The Corner, creator David Simon isn’t looking for simple descriptions in his work. His Treme weaves a rich and detailed tapestry about the lives of the people of New Orleans as they try to rebuild their city and their futures. 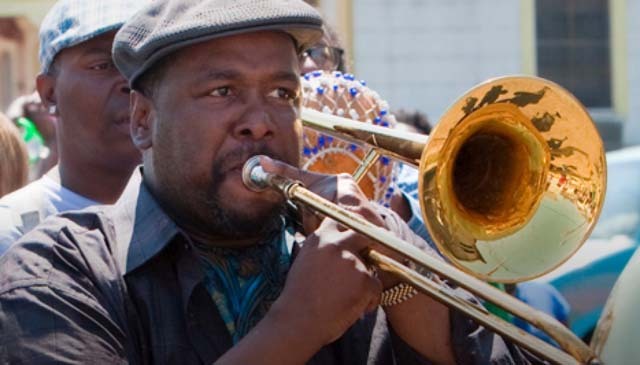 Wendell Pierce takes it to the streets in Treme. As is Simon and his team’s method, there are a bunch of overlapping and extended storylines going on in Treme, and though they don’t draw you in as quickly as those in his previous series, viewers in for the long haul will find the narratives and characters ultimately satisfying. I was most taken by the story threads involving struggling restaurateur Janette Desautel (Kim Dickens), hardened English teacher (John Goodman HBO’s You Don’t Know Jack) and his lawyer wife Toni (Melissa Leo, Welcome to the Rileys), musicians Annie (Lucia Micarelli) and Sonny (Michiel Huisman The Young Victoria), and DJ Davis McAlary (Steve Zahn, Diary of a Wimpy Kid), whose problems go way beyond coming up with a playlist. There are a bunch more that could prove equally rewarding for those who descend into Treme for a second or even time, and then supplement the viewing with the fine extras that can be found on the discs. The bonus features are led by full-length cast/crew commentaries on five episodes. The talent is sprinkled liberally across the quintet of tracks: Simon and co-creator Eric Overmyer are on the first episode, cast members Wendell Pierce and Khandi Alexander do the talking on another one, and various writers, directors and other actors can be found on the remainder. It’s a well-portioned selection of contributors talking about virtually every aspect of the production, all of them expressive when revealing their frequently emotional emotional feelings about the city where the drama takes place. Speaking of which, New Orleans plays as major a role int eh supplemental package as it does in the series proper. The featurettes The Making of Treme and Treme: Beyond Bourbon Srtreet explore the city, it’s history and the challenges of producing a series there following a catastrophic natural disaster. The show’s indispensable music, which serves as both a subject, a metaphor and a soundtrack, gets its due via music commentaries on all the episodes made by jazz radio personalities Josh Jackson from WGBO and Patrick Jarenwattananon from NPR.